Tim Tholen, CEO and Founder of Thoughtful Health Care and its affiliates in Kansas City hosted experts Michelle Niedens, Licensed Social Worker, and the director of My Alliance for Cognitive Health, a community-based program focused on early detection, provider partnerships, and education and Eric Vidoni, PT, PhD, Director of the Outreach, Recruitment and Education Core for the University of Kansas Alzheimer’s Disease Center and a Research Associate Professor in the Department of Neurology at the University of Kansas Medical Center. ​For the live video, “Why Early Detection of Dementia is Important,” Michelle and Eric lent their expertise to speak about the importance of detecting Alzheimer’s disease in its early stages. Preventative measures, treatments and lifestyle changes can be applied to slow a progressive disease like Alzheimer’s when it is detected in its early stages. Though Alzheimer’s disease doesn’t have a cure, doctors and scientists have made progress in providing treatments. 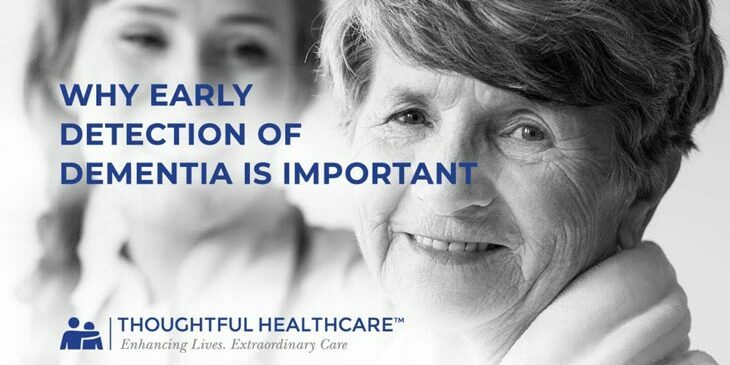 Because early detection allows for more effective treatment options, a complete and thorough evaluation for dementia makes sense, especially considering that evaluations boast a 92% accuracy rate. It’s worth taking the time to get checked. Our brain is the command center for our bodies, boasting more than 100 million neurons. Yet because of stigmas and limited understanding of its functioning, testing for dementia is performed less often than other tests. Now, as a culture, we are beginning to understand that we need to care for our “command center” and its functioning. Those family members who are noticing a decline in a loved one’s cognition and functionality might consider having a conversation about getting checked for dementia. Diagnosing a cognitive disease in its beginning stages can help a loved one live a happier, more fulfilling life. Kansas City Home Care is in the business of providing in-home care for people with memory issues like Alzheimer’s. Please contact us for more information about the services we provide to families in the Kansas City metro area.